Swierk, M., Williams, P., Wilcox, J., Russell, K. G. & Meyer, B. J. (2011). 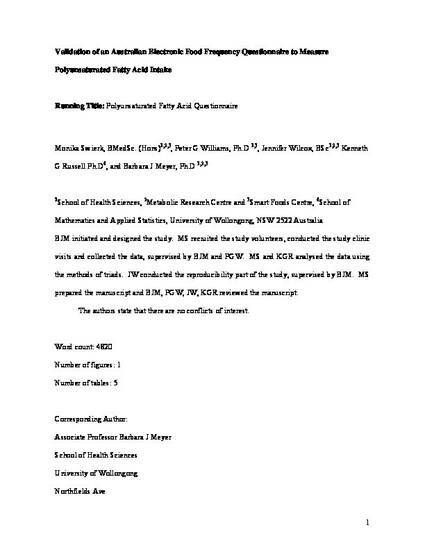 Validation of an Australian electronic food frequency questionnaire to measure polyunsaturated fatty acid intake. Nutrition, 27 (6), 641-646. Objective: To develop and validate a simple non-invasive method that estimates the intakes of omega-3 and omega-6 polyunsaturated fatty acids (PUFA) in a healthy adult population. Methods: A new electronic PUFA food frequency questionnaire (FFQ) was validated by comparison with a 3-d weighed food record and blood biomarkers (erythrocytes and plasma) using the method of triads model and tested for reproducibility. Healthy subjects were recruited from the local Illawarra Region, New South Wales, Australia. Results: The PUFA FFQ adequately estimated intakes for eicosapentaenoic acid, docosahexaenoic acid, total long chain omega-3 PUFA, linoleic acid, total omega-6 PUFA, and total PUFA, which were comparable with results from the 3-d food record. Eicosapentaenoic acid, docosahexaenoic acid, and total long chain omega-3 showed high validity coefficients for erythrocytes (and plasma) 0.92 (0.87), 0.69 (0.64), and 0.78 (0.73) (P < 0.05), respectively. Spearman’s rank correlation coefficients ranged from 0.48 to 0.76 when the PUFA FFQ was tested for reproducibility (P < 0.05). Conclusion: The electronic PUFA questionnaire was found to be reproducible and is a valid tool to assess PUFA intakes in a healthy adult population.